This ring pillow is a fitting compliment to your wedding rings--a sophisticated style for an elegant wedding. The small tucks are carefully hand sewn to make a pillow top that will go so well with many of the dresses popular today. 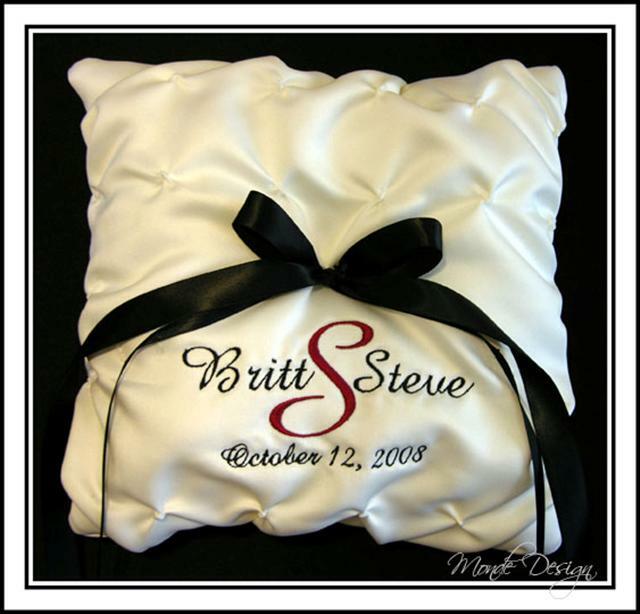 The example pillow is white satin with clear Swarovski crystals on the tucks surrounding the black ribbon tie. However, since this is a custom made item, the pillow can be made to your specifications. The crystals can be any color, as can the fabric and tie. The style of tie can be changed as well. Since this pillow will be hand stitched especially for you, even the arrangement of the tucks is optional. If you would like an exact match on color, please send a swatch of fabric. We will work together to make something we can both be proud of. Embroidery is also available on this pillow, for an additional fee. The embroidery takes the place of a portion of the tucks. See here for font choices. Please feel free to contact us with any questions regarding the customization of this item. Because this item is custom made per order, it will follow our general completion guideline of 4-6 weeks. Please contact us directly if you need your item sooner, and we will see if we can fit it into our lineup for you. Rush ordering is available for $10, which guarantees that your item will ship within 2 weeks, but on an item such as this it must be approved in advance. And specific ideas or instructions for this pillow?